I attended a Berkeley Arts & Letters event last week featuring Robert Scheer, whose new book is The Great American Stickup: How Reagan Republicans and Clinton Democrats Enriched Wall Street While Mugging Main Street. This book and Bob's previous one, on military spending, have something very important in common; both show that the two major parties really do cooperate. Unfortunately, it's on all the wrong things. Bob makes a very strong case that the Republicans (starting with Reagan) and the Democrats (especially under Clinton) enabled an enormous financial disaster that ruined millions of households in the form of foreclosures, unemployment, and diminished home equity and retirement savings. As if that weren't enough, the same people who engineered the disaster vilified public servants who tried to avert it and then, under Obama, mismanaged the effort to limit the damage. Really appalling. The heroes are few and far between, but one is certainly Brooksley Born, who headed the Commodity Futures Trading Commission under President Clinton. 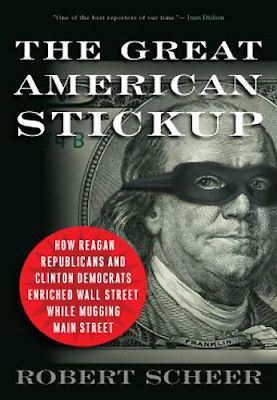 She pushed to regulate derivatives trading and was scorned by the so-called Committee to Save the World--Alan Greenspan, Robert Rubin, and Lawrence Summers--as well as the holy zealots of deregulation, most notably Wendy and Phil Gramm. Wendy Gramm preceded Born as chair of the CFTC, and both she and her husband profited nicely from efforts to "modernize" (that is, gut) oversight of the financial markets. Having secured a regulatory exemption for Enron, she became a board member there and served on its audit committee. Former Texas senator Phil Gramm took a position at UBS, the bank that was later bailed out by the Swiss and U.S. governments. He later served as economic advisor (!) to John McCain. Rubin also made out like a bandit, encouraging Clinton to eviscerate oversight and then accepting a position at CitiGroup, where he earned $15 million a year until that company had to be bailed out, big-time, by U.S. taxpayers. Summers also received millions from Wall Street firms for his wisdom before heading up Obama's economic team. And what to say about people like Alan Greenspan and Henry Paulson? Greenspan was another Born adversary. As Fed chair, he was supposed to regulate the banks, but as an Ayn Rand-style libertarian, he didn't even believe in regulation. The markets would take care of everything. Paulson made sure Goldman Sachs, which he left to become Treasury secretary under President Bush, got everything it needed, most notably full payment of the bad bets AIG had insured but couldn't cover. And then Paulson decided to let Lehman Brothers, a Goldman competitor, go down in flames. I've worked on two Dean Baker books (Plunder and Blunder and False Profits) that cover some of the same territory, but Bob is more focused on the political side of the story--and especially the people responsible for the fiasco. Highly recommended. Peter Seidman's piece on the Green New Deal for the North Bay got picked up by CommonDreams (and other sites) this week. The piece originally appeared in the Pacific Sun, the alternative weekly in Marin County. 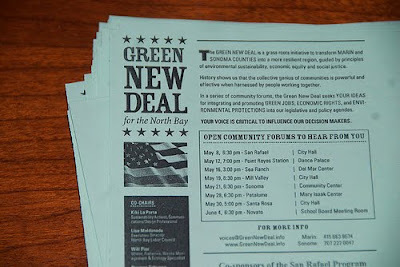 Fanatical readers of this blog will recall that Norman Solomon recruited me to the Green New Deal commission last year. We issued our report last week, and Norman has been supervising the media outreach. As a result of the CommonDreams piece, a Richmond office holder contacted me yesterday. He's interested in launching a similar project here. 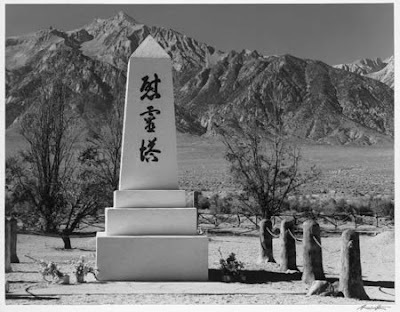 I should have read this a long time ago, but I finally got to Farewell to Manzanar by Jeanne Wakatsuki Houston and James D. Houston. (Turns out I interviewed Jim for the McWilliams bio; he was a big fan of C-Mac.) What a delightful book. It certainly brings out the injustice of the Japanese internment during World War II, but its simplicity, understated elegance, and humanity go far beyond lamentation. Farewell is on the reading list for one of my classes at San Francisco State (Values in American Life). I've worried at times that the materials for this course, which focuses on migration and immigration, are too bleak. (I had to pull them together on very short notice, courtesy of California's budget problems.) But although this book focuses on a sad chapter in American history, its main subject is a family under extraordinary pressure. The portrait is very specific, but I suspect that anyone with a family can relate to it at some level. We read The Grapes of Wrath before this. The books have a lot in common, but Grapes is longer and more relentless. Farewell was a tonic by comparison. PoliPointPress is launching a new series called P3 Classics. The idea is to revive fantastic books on politics that, for one reason or another, are out of print. The first title is a personal favorite of mine–-Greg Mitchell’s The Campaign of the Century: Upton Sinclair’s Race for Governor and the Birth of Media Politics. 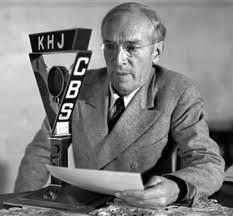 It recounts the landmark 1934 campaign by checking in with a wide range of public figures–Sinclair, FDR, Hearst, Huey Long, Chaplin, L.B. Mayer, Herbert Hoover, Mencken, Ty Cobb, etc.–on a day-by-day basis, starting with Sinclair’s nomination and ending with the general election. Amazing. Greg’s claim is that this race’s impact far outstripped its statewide significance. In fact, the techniques brought to bear on this race revolutionized the use of mass media in U.S. politics. Earlier this year I attended an event at the Swiss consulate in San Francisco and chatted with a member of the Swiss parliament in town to discuss direct democracy. I mentioned that I was trying to reissue a book about Upton Sinclair. “Mitchell?” he asked hopefully. Greg is making lots of appearances to discuss the book, including segments on GRITtv and NPR’s “On the Media” this weekend. He also has a related article in The Nation. P3 is selling the book from the website; the print book is available now and the e-book is scheduled for Monday. Many Bay Area residents of a certain age will remember Michael Rossman, a student activist at Berkeley who died of leukemia in 2008. Others may recognize him from Berkeley in the Sixties (1990), a documentary I always include in my California Culture course at San Francisco State. 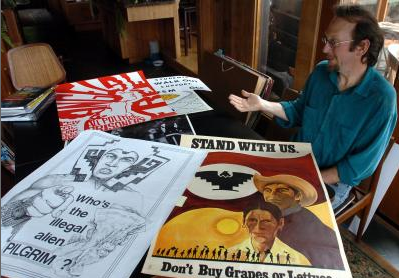 It turns out Rossman was also a collector of poster art from the the sixties, and Lincoln Cushing, my colleague at the California Studies Association, has recently processed, photographed, and transmitted the collection of over 23,000 posters to the Oakland Museum of California. Kristin Bender's piece in the newspaper today has all the details.